Today I am delighted to be sharing a couple of cards with you using a fabulous set of stamps from Tracey Hey of Alpaca Pals. 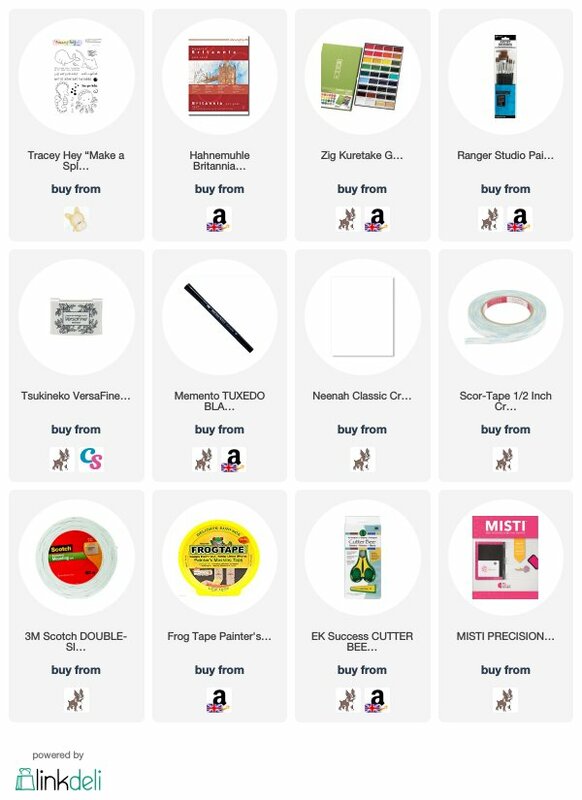 Tracey has an Alpaca Farm down in Dorset in the UK and she has started selling a line of high quality clear stamps (along with a number of other things in her shop). 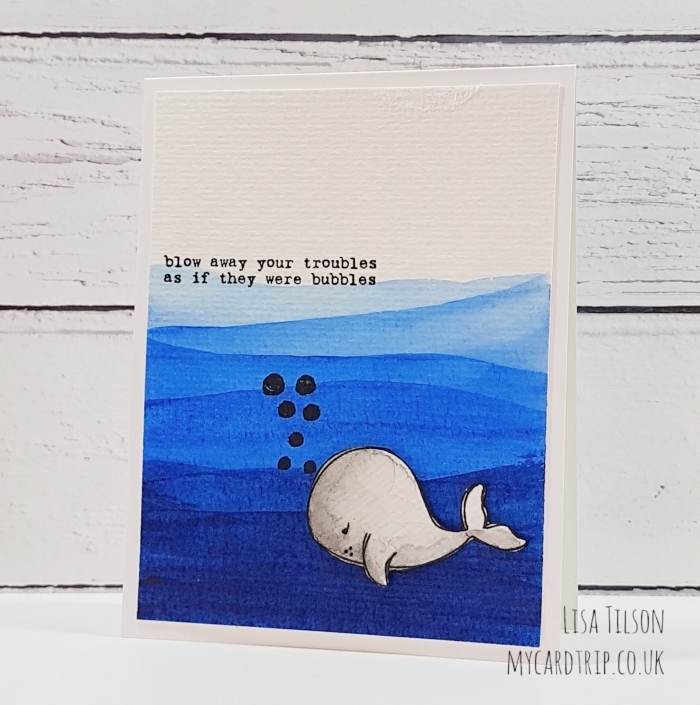 Tracey very kindly sent me some of her stamps to have a play with and today I have the pleasure of sharing two cards made with the Make A Splash set. As I had my Gansai Tambi paints out it seemed rude not to make two backgrounds and hence two cards! Both backgrounds were created the same way. I taped my cardstock to a clipboard using some masking tape. I then set about adding layers of blue paint and drying in between. I just used two colours of blue paint and a no.6 round brush. It didn’t take long, about 20 minutes for the two panels I think, and I love how unique each one ends up being. All paint colours are listed below. The panels were trimmed once dry and then set to one side. 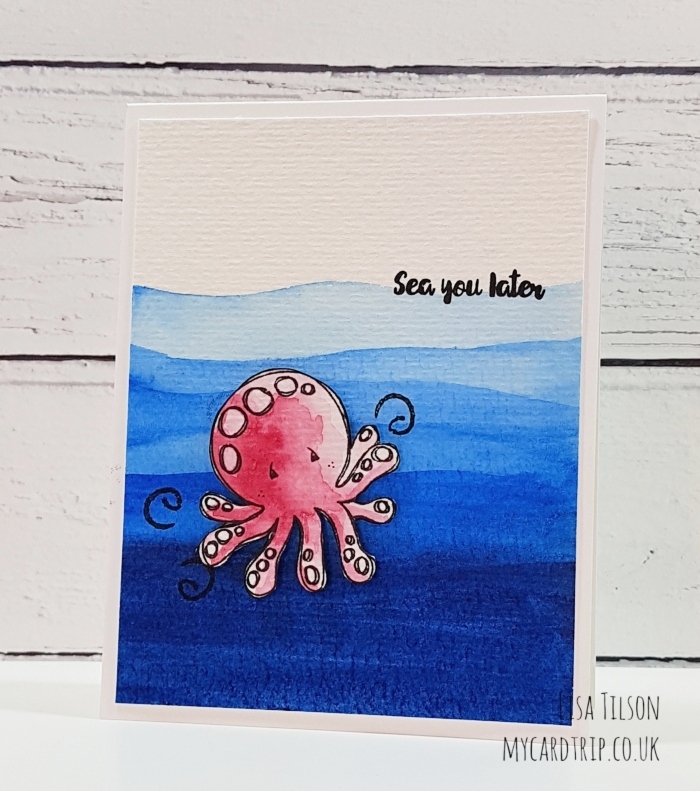 I stamped both the whale and the octopus using Versafine Onyx Black Ink (waterproof) onto the same watercolour cardstock as the background panels. They were coloured very very loosely with the Gansai Tambi paints – really easy, just a few layers, drying in between. I then fussy cut them out and ran a black marker around the edges just so they look finished. The panels were popped into my MISTI and the sentiments, bubbles and swirls stamped again using onyx black ink. All that remained for me to do was add some double sided tape onto the back of the panels and adhere them to my base card (A2 top folding Neenah cardstock). The whale and octopus were then popped up with foam tape. Aren’t they just super cute and the sentiments fabulous? 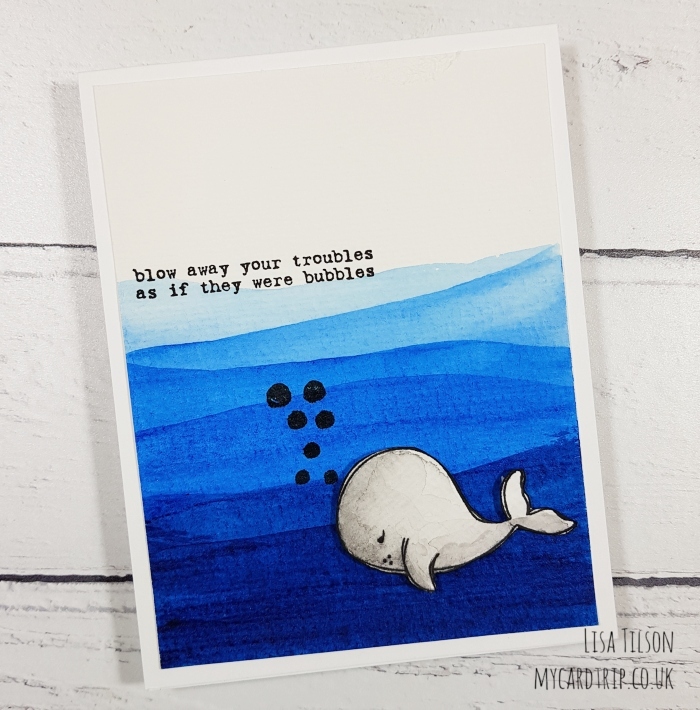 I will be sharing a few more cards with you over the next few weeks – all of them have wonderful encouraging sentiments and super sweet images! Thank you so much for joining me today, I wish you a fabulous weekend and hope you get some crafting in. 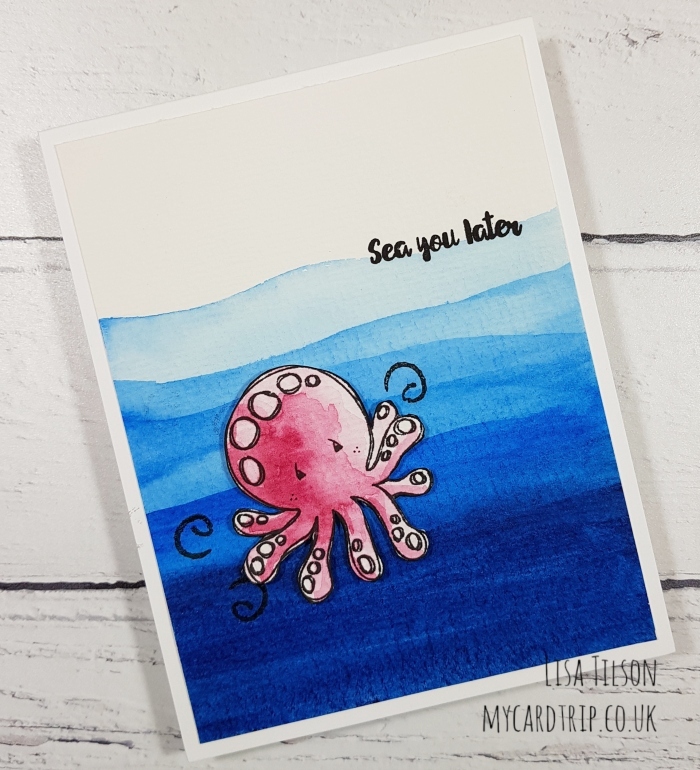 Fab, adorable images from Tracey aren’t they, I love her range. Yo uve made two fantastic sea cards, my seas never look real enough yet. Practice practice practice I know. Thanks for showing. nothing better than a cute little whale or octopus. Great backgrounds ,love the stamps. Great cards. Your backgrounds are amazing! Love these cards. Great text on both of them!